NOTE! This only works when using sheer on front track and lining on back track. As you are aware all our single Slimline, Décor and Diva tracks close on both ends no matter the heading on the curtain. 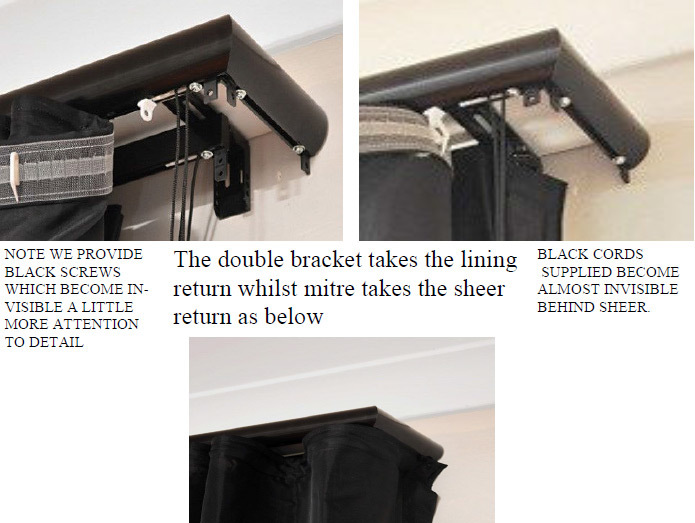 We’ve improved the standard one-way pull… in the past, one end is always open – which looks unsightly and cannot stop light or heat depreciating the benefits of the curtains insulative value. Uni-Q fixes this problem by closing both ends! Only Uni-Q can close on both ends – no other track can do this! If you have a door you want to look through or walk through, you simply open the lining FIRST and then, if going through door, pull the sheer SECOND. Your maker must know the correct measurements. ON THE LINING YOU NEED AN EXTRA 6CM RETURN. Sheer requires 17cm returns at both ends so formula for pleating is track + 17cmR + 17cmR + 4cm for creapage this may need to be increased if drape is very large. Formula for rear lining track + 6cmR + 6cmR + 4cm creapage.